One thing you need to keep in mind when planning your meal at Biergarten is that seating is family style, and you will likely be dining with strangers. A lot of people have a problem with this, for whatever reason. However, the fun interactions we've had with random table mates is a big reason why we fell in love with Biergarten in the first place. Just embrace it...at the very least, talk about Disney World and your mutual love of Epcot/beer/glockenspiels. 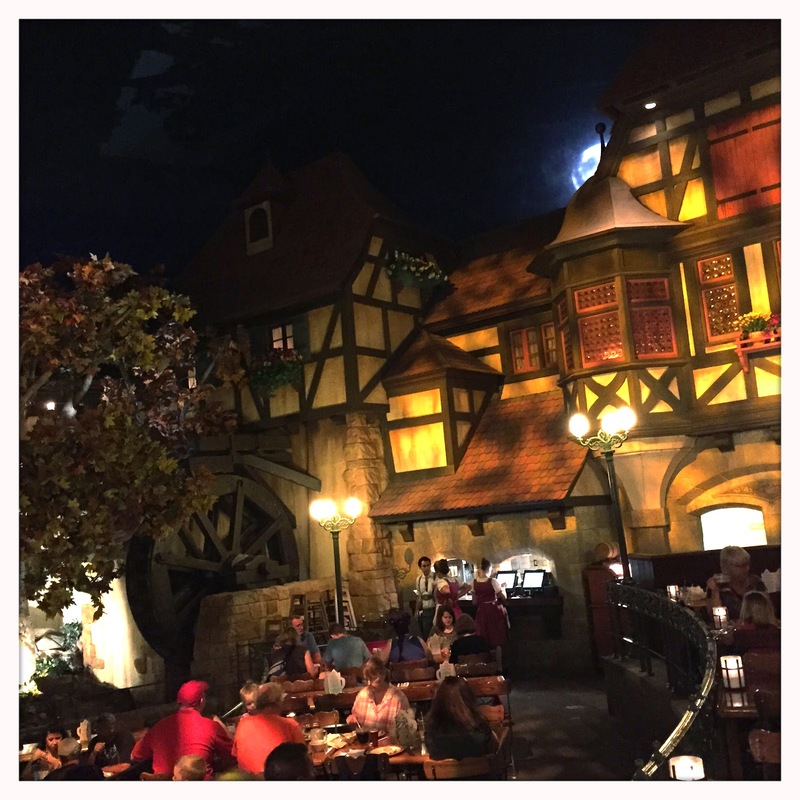 Biergarten is among the most beautifully themed restaurants at Walt Disney World. The inside is an "open air at dusk" German beer garden. The whimsical architecture, trees, and waterwheel that surrounds the stage and tables really ramps up the awesome atmosphere. Speaking of stage! The absolute highlight of Biergarten is Oktoberfest Musikanten, the amazing oompah band that plays here daily. Their show is a raucous good time that we look forward to each trip. They. Are. Perfect. Try and plan your advance dining reservation around their show. After settling in with your new friends, and placing your drink order with your obnoxiously attractive German server, you're free to hit the buffet. 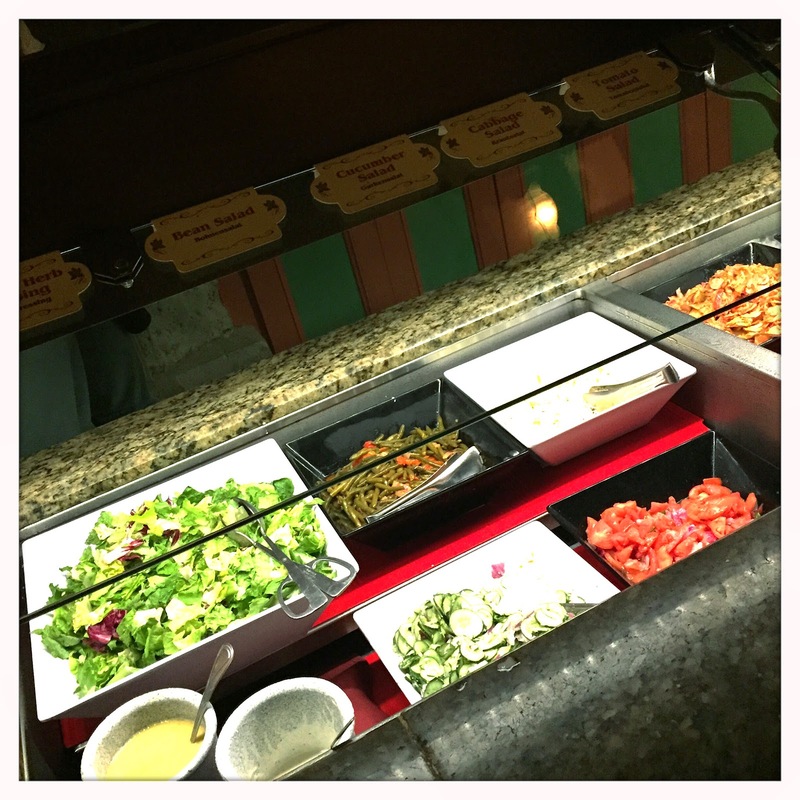 This is not the largest buffet at WDW by any means, nor does it have the best veggie options. (that honor goes to Crystal Palace...surprising, right?) But there is a pretty decent selection, including some real winners. The cold salad station rarely changes...and includes green bean salad, marinated tomatoes, cucumber dill salad, potato salad, and bean salad. There is also a basic lettuce mix with various dressings. This is a fun way to start your meal, especially if you're like me and love salad. Dont fret if salad isn't your thing, there are plenty of hot savory dishes for you vegetarians as well. These tend to change a little bit more frequently. 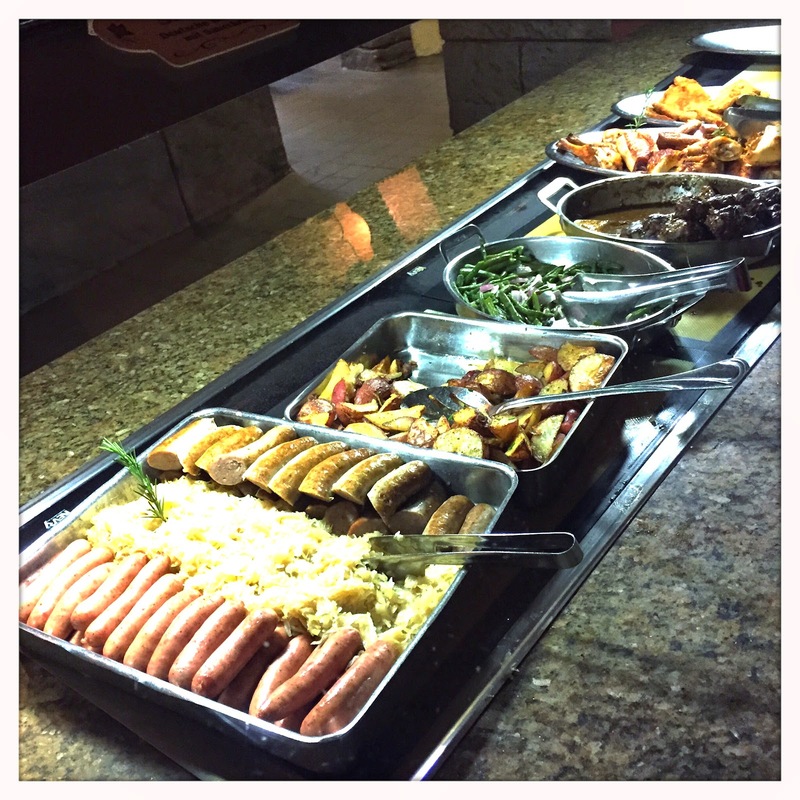 The selection will surely include warm sauerkraut, various roasted veggies, and potatoes. If you're a vegetarian always pay attention to these as some may have bacon in them. Adam comes to Biergarten with one thing on his mind: nudel gratin. This is basically German mac and cheese and is super delicious. In fact, its popularity has outgrown Biergarten and is now available at the Sommerfest restaurant outside. We also really enjoy the spaetzel...especially with mustard. The sautéed green beans are a thing of beauty. Now on to some controversy. 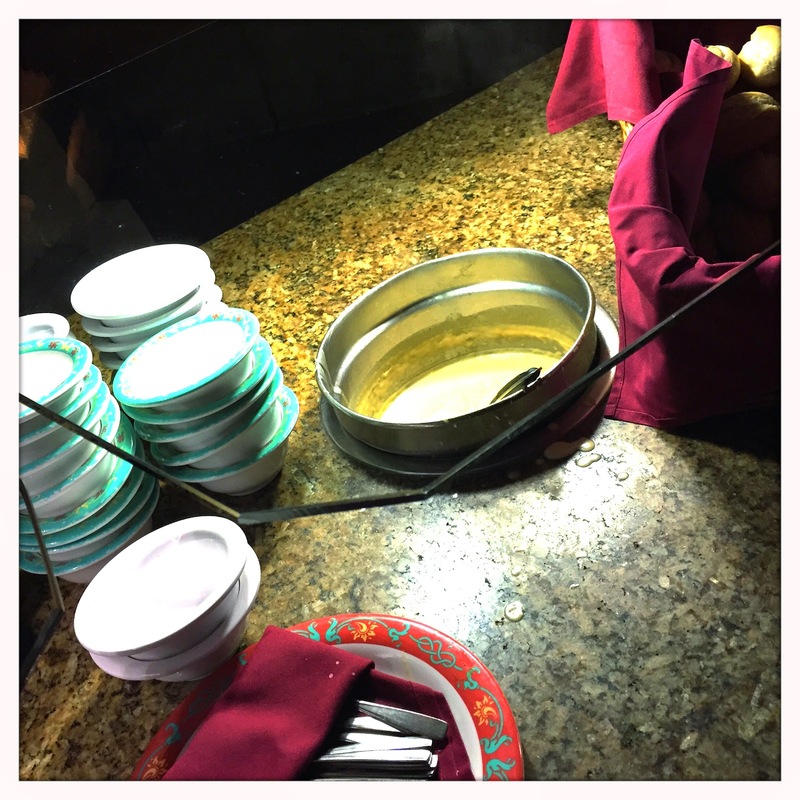 The soup here tends to alternate between a few different soups including a cheddar beer soup and a cauliflower soup. Something as simple as soup should come with simple answers. However, when prompted about whether or not the soup is vegetarian the cast members will stare blankly at you for a solid minute and a half before saying Of course its vegetarian! Its cauliflower soup... At which point you may have to ask a manager. We have been told that YES it is vegetarian (no chicken stock...) and NO it is not. When it comes to this, always ask...and trust your gut. My feeling is that there probably is chicken stock. But you should be the judge. On to happier things! Sweets! The dessert at Biergarten is truly a magical thing. A spread so spectacular I often sample everything available. The bavarian cheesecake, pear strudel, and black forrest cake are personal favorites. There is also ample vanilla sauce to drown these sweets in. Do not skip dessert! 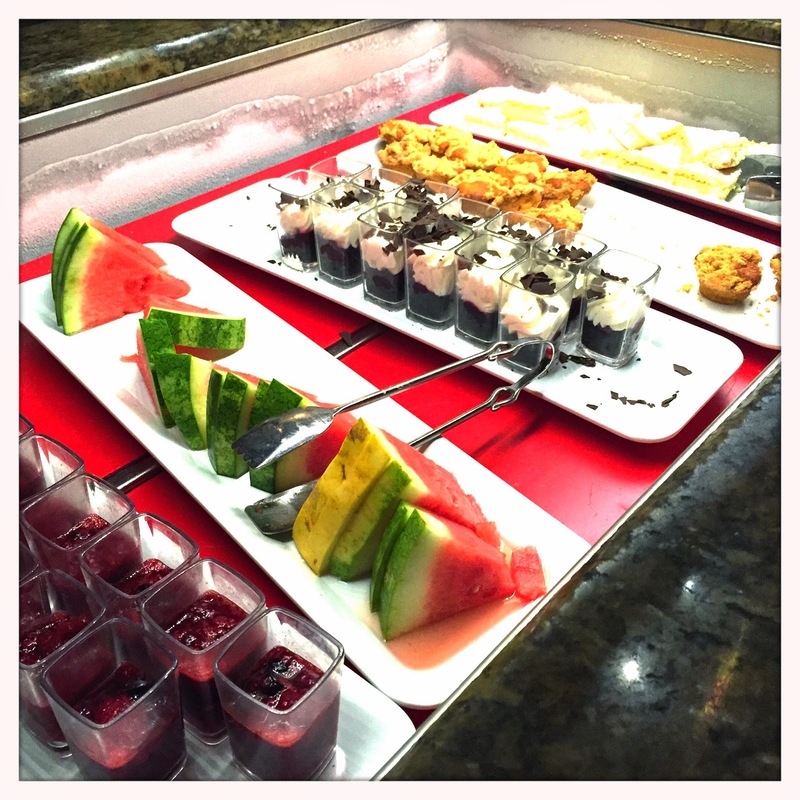 One thing that people often look past at buffets is the fact that coffee and tea is included in the price. Make sure by dessert time you've ordered your coffee, because the servers can be hard to track down. 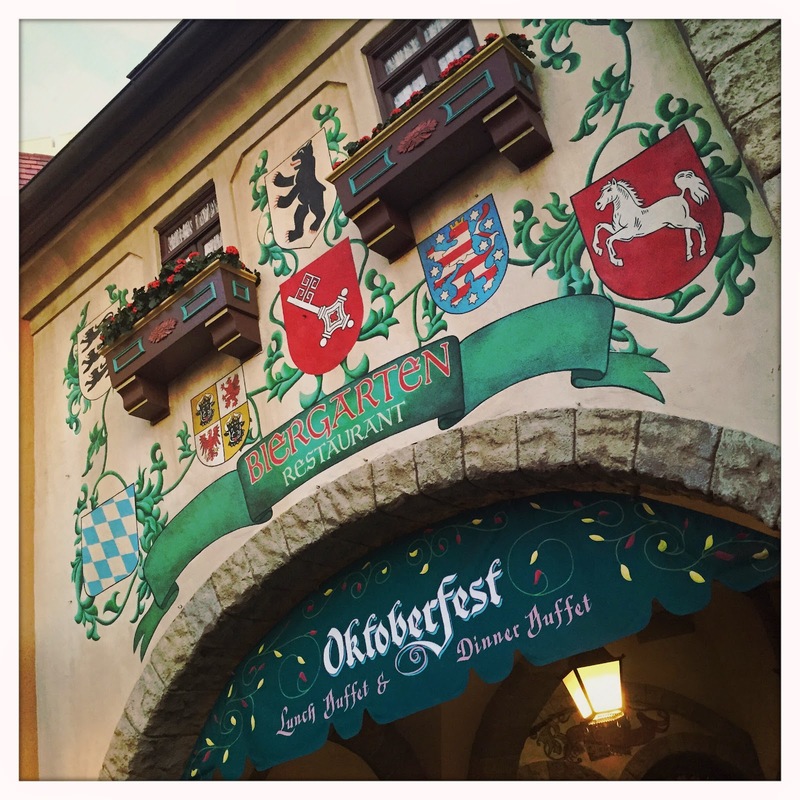 There is nothing more perfect than coffee, bavarian cheesecake, and watching a show by Oktoberfest Musikanten. Yay! I finally got around to reviewing one of my favorite places in the entire world! Bad lighting be damned! Traditionally we eat at Biergarten on the first day of our trip, because nothing says Your at Disney World more than this restaurant. I can't wait to get back. I haven't been, as I can't resist sitting in front of the pyramid in Mexico on Epcot days...those margaritas, aaah...but I do want to try it someday! I just wanted to say I love the hipsters! I just went on my first trip to WDW and really enjoyed listening to your podcasts as I planned my trip. Please keep them coming and I'd love to hear more "advice" style shows for those of us for are WDW newbies....thanks! SO GOOD. Also vegetarian and its my go to meal. For the longest time I wouldn't go because I thought it was just sausage and sauerkraut but there are definitely options. Its where I go to carbo load. Spätzle, potatoes, macaroni salad, riesling wine flight. EPIC.